MANILA – An installation art dubbed as “Cast the first stone” is one of the first to greet visitors at the recently opened End ENDO art exhibit. Fr. Jason Dy installed it in support of the struggle of NutriAsia workers. Before the opening of End ENDO art exhibit on October 8 at the Atelyer Gallery, Bulwagan ng Dangal, UP Diliman’s Main Library, Fr. Dy revisited the site of NutriAsia workers’ former picketline. 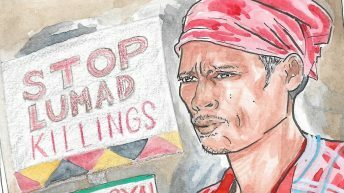 There, he recalled how the police, security guards and non-uniformed “goons” combined last July to use force in demolishing the workers’ strike. The police started by throwing stones at the strikers while a mass was being celebrated. 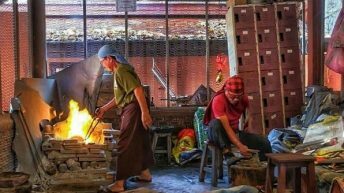 The stones were wrapped in towel and paper as if to disguise it, but the video footages show tissue paper and towel separating from the stones before it reached the workers’ picketline. At the End ENDO art exhibit, some stones the priest picked up at the site of the picketline are wrapped in towels and tissues which he painted red. These stones surround a table on which a bottle of wine and a bottle of water stand. The priest used empty UFC catsup bottles, one of the products of Nutri Asia. To Fr. Dy, water and wine represent the struggle. On a nearby dais, a box holds plenty of UFC catsup bottles seemingly full of blood. 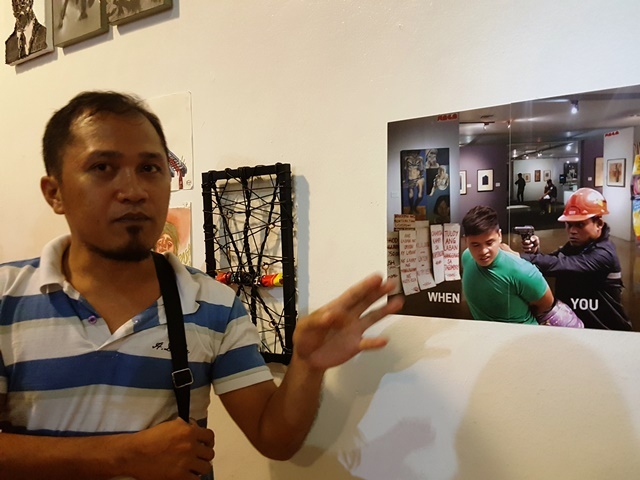 Beside it is a streamer handpainted with calls to fight fascism, and hanging above the nearby wall is probably a portrait of the owner of NutriAsia, Mr. Joselito Campos. Showing a sample of fascism, video footages of the strike dispersal play continuously at a flat TV screen. 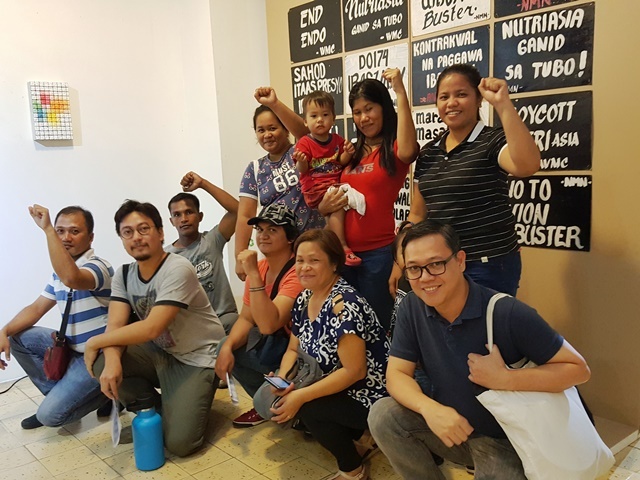 The combined force of the Bulacan police, security guards and alleged goons of Nutri Asia are hitting, kicking and punching at the strikers left and right, pushing them away from the picketline at the factory’ gates. Watching the video with her son in her arms, Jeovellyn Bornales, 33, can’t help but shed tears. 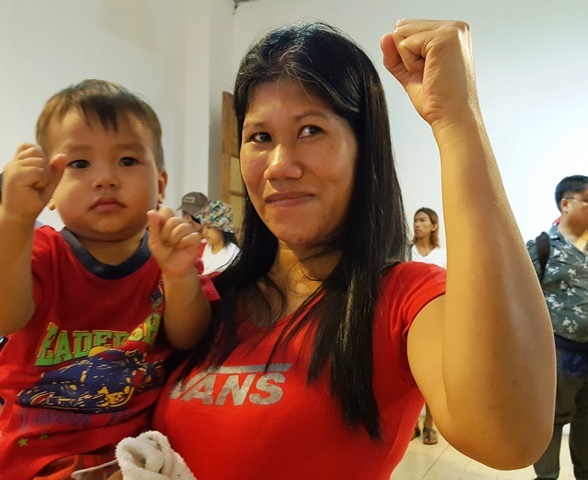 She brought her son to the screen, pointed to a woman in a black shirt, holding a flag of the Nagkakaisang Manggagawa ng Nutri Asia. “That’s me,” she said. The woman and the flag disappeared in a melee of police truncheons repeatedly going up and down on the striking workers. Bornales said she was black and blue for days. 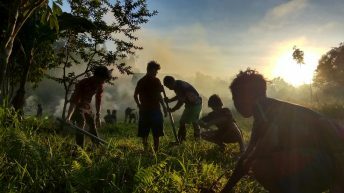 NutriAsia restarted production after the violent dispersal, their second violent dispersal. Bornales said it hired new contractual workers from another agency. Meanwhile, the Altermidya journalists who took the videos had successfully stowed away the memory cards. Unfortunately, their cameras were confiscated by the police who arrested them and never returned it to the journalists. 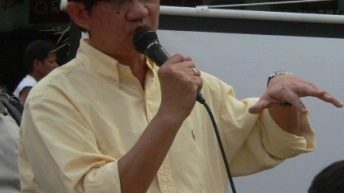 Neither were the confiscated smartphones of the arrested supporters of the workers’ strike. Altermidya journalists said they clearly saw a policeman pocketing one of those smartphones. The striking workers were met with guns when they tried to reestablish their picketline. A picture of it is also displayed at the End ENDO exhibit. 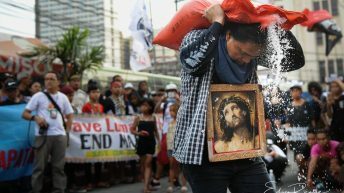 Pointing to the picture of a worker in a green shirt held at gunpoint by a NutriAsia guard, Jimmy Ponce, a NutriAsia worker for nine years in its Golden Fiesta cooking oil production, said that that worker was later severely beaten up by the guards. NutriAsia is just one of the big, profitable companies continuing to resort to endo (end of contract or contractualization). Rogelio Magistrado from the Samahan ng mga Manggagawa sa Jollibee Foods Corp- Jollibee Worldwide Services Logistics, recounted how they were literally hostaged at a meeting to force them to avail of resignation packages. How those who signed away their 12, or 8, or 4 years’ record as contractuals in exchange for another contract were given a Jollibee Yum Burger. “Ninety-seven workers were illegally terminated in Jollibee. 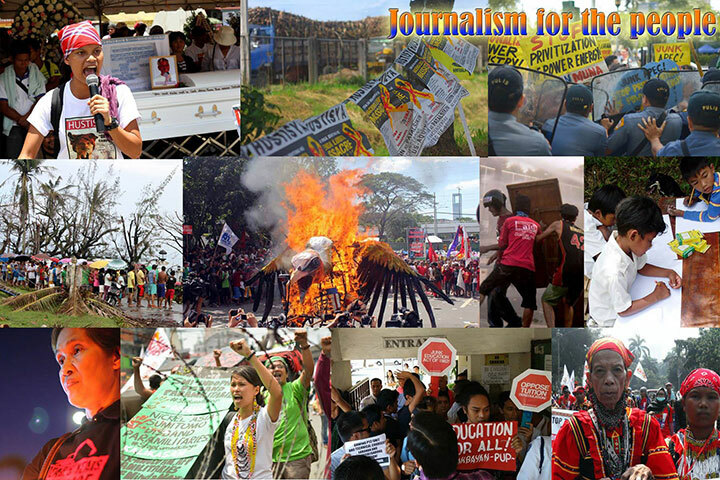 We put up a protest picket, but we were continually harassed,” Magistrado said. “We became victims of President Duterte’s lies about ending ENDO,” Magistrado concluded. The artists subvert the format by transforming it into a canvas for workers’ struggle. 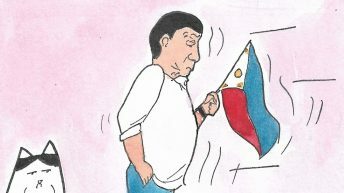 Among the pieces on exhibit are comic strips on Martin the wisecracking activist cat published in bulatlat.com by its resident cartoonist, Dee Aleli Ayroso. At the opening, musicians from groups such as the General Strike and Musicians for Peace also dedicated songs about the workers’ life and struggle. As did some groups of writers who read poems for workers. 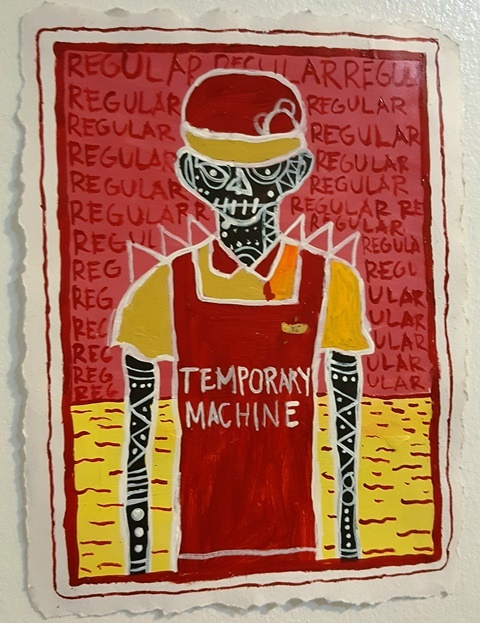 “This exhibit is timely, given that the workers are gravely hit by the economic crisis,” said Jaime Calma of UgatLahi Artists Collective. 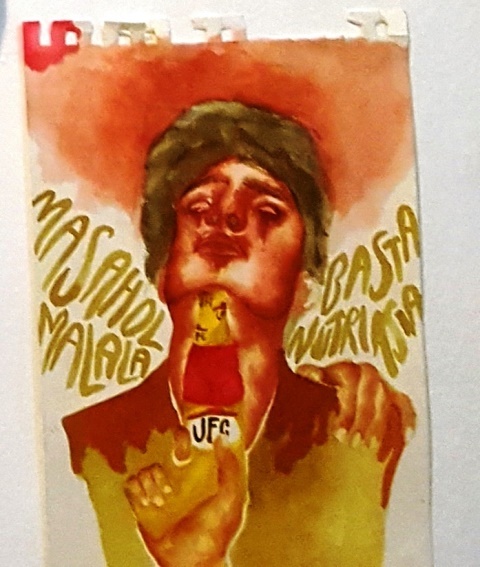 A UP Fine Arts student, he and Ugat Lahi have artworks for workers in the exhibit. The artists invite more workers, students and artists to see and join the exhibit, contribute more works and put up more End ENDO exhibits. 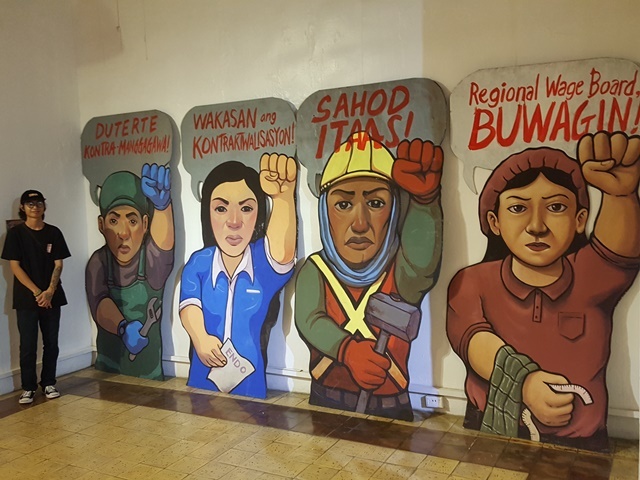 “Wherever there are attacks to human dignity, workers will be pushed to express their struggles in all available forms, and artists will be there to assist and participate in this collective articulation,” said the statement of artists against contractualization.